2. Click start, run. Write: control userpasswords2 and click ok to “open advanced user accounts control panel”. 3. Make sure “Users must enter a user name and password to use this computer” is disable. Click ok.
4. Specify username and password to use in autologon. The problem is that you need to “elevate to administrator privileges” (run as administrator) to add a TCP/IP port. I have’nt found any way to do that when adding a printer. 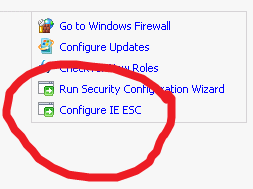 The solutions is to logon as administrator in the console and then add the print and TCP/IP port. 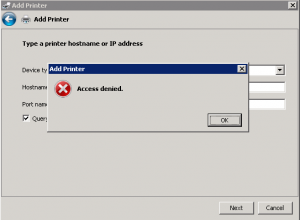 To add a printer as administrator do the following. 1. Open printers in control panel. 2. Right click in the white area. Choose “Run as administrator”/”Add printer…”. 2. Click on features and add features. 3. Select Windows PowerShell. Click next, install and close. 4. You can now find PowerShell under all programs.